DO-17001-06 was succesfully added to your cart. 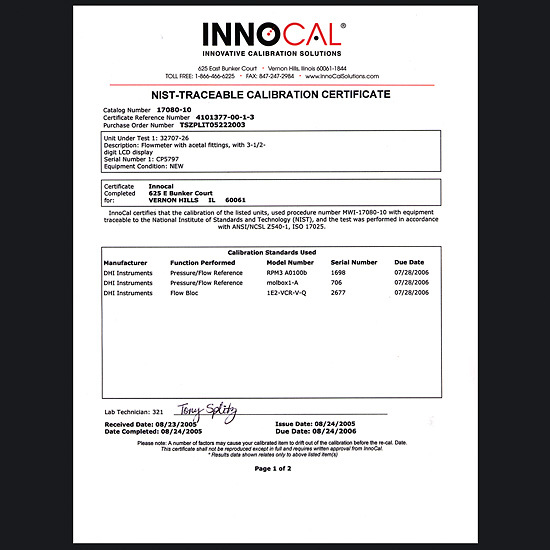 Regardless of the type of thermometry probe your application requires, InnoCal can ensure the accuracy of your meter, probe, or system!InnoCal's Metrology Laboratory is accredited to ISO/IEC Guide 25 by the American Association for Laboratory Accreditation (A2LA); certificate number 1746.01. This accreditation is your assurance that one of the foremost outside auditing agencies approves of our internal laboratory policies and procedures. Item 017001-06 is not a probe. This is a NIST-traceable certification / calibration only. This would be added into your cart along with the Thermistor probe of your choice in order to indicate that you would like your purchase calibrated to NIST-traceable standards and have a calibration report with data shipped with your probe.